Parisienne. Abstract female mannequins for sportswear, for evening wear, for every style in between. As with all Vaudeville Decter mannequins, any head can be used on any pose we offer at no additional charge. 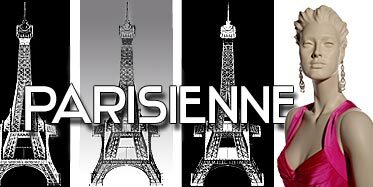 Each Parisienne mannequins is available in Carrera White, Jasper Black, Ivory, Satin White, Gloss White, Gloss Black, Thunder Gray, Metallic Silver, and Metallic Gold at no additional charge. Pearl White is available at an additional 20% upcharge, as well as any custom or Pantone color. There is a minimum order of two mannequins for custom colors/finishes. All Parisienne mannequins are available with hand-painted facial features at $879 each. See photos below. Any Parisienne mannequin can be ordered with a hand-painted face, as above. Please add $20 each. All Parisienne faces are available as jewelry displayers. See Torsos and Forms.